The writer discusses her new novel, love, justice, and Indian politics. 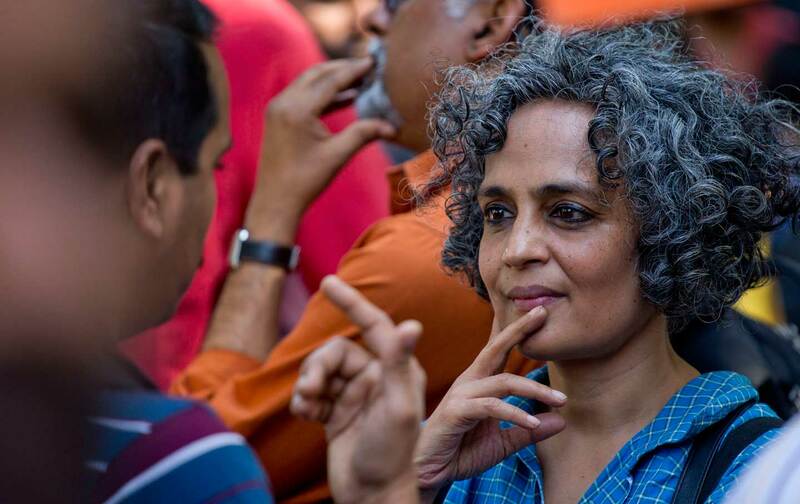 Most middle-class Indians hate Arundhati Roy—or, rather, they hate the political activist she has apparently become. She was palatable as a novelist; in fact, Roy was widely celebrated back in 1997, when her debut novel, The God of Small Things, won the Man Booker Prize. But now her stock has fallen. Roy then defended Afzal Guru, a Kashmiri Muslim who supposedly masterminded the 2001 attack on Parliament. She did reveal that there was no evidence against him, but, again, surely this is a small matter when the “collective conscience of society” is at stake. Later—and this was the final straw—she visited the Maoists in Chhattisgarh and did not denounce them. Middle-class Indians will say such things about Arundhati Roy—in public, on television, through WhatsApp. But they always include, by way of qualification, their abiding love for The God of Small Things. This is the worst sort of bourgeois philistinism, for a decent reader would recognize that her fiction and nonfiction are animated by the same fierce love of justice—and make the same demands on readers. They’ll have to find a new rhetorical technique to express their admiration for The Ministry of Utmost Happiness, Roy’s much-awaited second novel, which was published in June. It’s a sprawling story about people on the fringes of modern India, and, as such, does not accommodate itself to pieties about “language” or “feeling.” Impressively, The Ministry of Utmost Happiness is entirely unlike The God of Small Things in its structure, style, texture, and ambitions. I discussed this formal departure, among other things, with Roy over the phone recently. She was disarmingly kind (as kind, really, as her prose is merciless). Below is a transcript of our conversation, which has been lightly edited and condensed. The Ministry of Utmost Happiness is a formal departure for you. Your previous novel, The God of Small Things, was essentially about a family. By contrast, Ministry is a sprawling political novel: It addresses impunity, caste, institutional violence, the rise of Hindutva, the troubles in Kashmir. You allude to this through a funny in-joke: In “The Reader’s Digest Book of English Grammar and Comprehension for Very Young Children,” which your protagonist Tilo is composing, she confesses that she “would like to write one of those sophisticated stories in which, even though nothing much happens, there’s a lot to write about.” But then she admits that this “can’t be done in Kashmir. It’s not sophisticated what happens here. There’s too much blood for good literature.” What are the challenges of dealing with this sort of subject matter? Well, The God of Small Things is about a family, which has a broken heart at its center. It looks at the violence in the heart of the intimacy that is supposed to be the family. I think a writer’s relation to family is deeply affected by their life, especially their gender. For many privileged, upper-class, male writers, family is often a place of security and assurance—their mothers are doing what mothers do, and the grandmothers are doing what grandmothers do. Whereas, in The God of Small Things, the family is a place of danger. The Ministry of Utmost Happiness turns this inside out. Almost none of the characters have families in that conventional Indian sense. What happens in Ministry is that people bring shards of their broken hearts from all over the place and create a mended heart in that graveyard—in the most unorthodox way, with most unorthodox forms of love. Of course, as a novelist, I never want to write about “issues” like “the Indian family.” What I want to write about is the air we breathe. These days, I feel that novels, I don’t know for what reason—maybe because of the speed and the way that books have to be sold—these days, novels are becoming kind of domesticated, you know? They have a title, and a team, and they are branded just like NGOs: you writing on gender, you writing on caste, you writing on whatever. But for me, the fact is that these are not “issues”—this is the air we breathe. There’s a connection between the fact that, as Hindu nationalism rises, Muslims are being ghettoized in India. It began long ago, and the Muslim community has always been hostage to the politics between India and Pakistan, India and Kashmir. The Muslim community is literally being pushed into ghettos. People are living in graveyards. To the West, it sounds like magic realism, but in Delhi you see it all the time: people living amongst graves and over graves in the old city. Fiction is the only thing that can connect all of this together. It’s the only thing that can show you the connections between people who all have incendiary borders running between them—borders of gender and caste and religious conversion; national borders like Kashmir; even between the state and the shambling inner life of a secret agent that does its dirty work. This reminds of a passage from “Walking With the Comrades,” your account of travelling with the Naxalites in Chhattisgarh. You admit there that “It’s hard not to see the Indian state as an essentially upper-caste Hindu state…which harbours a reflexive hostility towards the ‘other.’ One that in true colonial fashion sends the Nagas and Mizos to fight in Chhattisgarh, Sikhs to Kashmir, Kashmiris to Orissa, Tamilians to Assam and so on.” Ministry, in its structure, kind of reverses that by bringing all these people together under a tent. Exactly. The structure of a novel is important—it’s what allows you to break out of this process of domestication. The sprawling structure of this book, the narrative style—it’s almost like looking at a city whose plans are ambushed. It has unauthorized colonies and illegal entries. People come together in such places. In the chaos of the modern city, even a moment is not a moment—because you might be looking at the Nicaraguan jaguar, but then you’re getting SMS’s about some new building flats in Ghaziabad. There’s always stimulation; you’re being ambushed at every moment. To me, the idea in writing Ministry was: How do you walk through that city—the narrative city as well as the geographical city? In a city, you can’t walk past a person without wondering who he or she is. Who’s the guy who is guarding the Honda store? Where did he come from? What is his story? He’s not just a guy that you walk past. Who is the cobbler who is mending Comrade Azad Bhartiya and Tilo’s shoes? All these people have stories. They’ve come from different places. And this allows them to share their experiences and create a form of solidarity that could not exist in isolated villages. In The Ministry of Utmost Happiness, my challenge was to walk the reader through a city—the narrative city as well as the geographical city—and unlock its potential. For about two decades now, you’ve been doing journalism and political writing. Has that informed your return to fiction? And if it has, how so? I’m thinking about the long section of Ministry that’s set in civil-war Kashmir. The political essays that I wrote over the last 20 years, now when they’re collected into books and read by people—that might efface the circumstances of their writing. The fact is, I wrote those essays with a tremendous sense of urgency. They were written with a very particular purpose, each of them, because something was closing in. When I wrote “Walking With the Comrades,” the atmosphere in India at the time—you know, Manmohan Singh had declared the Maoists to be “India’s single largest internal-security threat”; Operation Green Hunt had been announced; the media was going crazy. Every day on TV, they just kept saying, “Maoists are terrorists, Maoists are terrorists”—they were describing the poorest people in the country, in the world, as terrorists, simply because they were standing up for their rights. All the traveling, and thinking, and meeting, and befriending people—all this sort of layered me like a sedimentary rock. Also, about Kashmir, I’ve traveled there a lot, but I haven’t written a big essay about the place, because I realized very quickly that the story of Kashmir cannot be told except in fiction. The story of Kashmir is not about how many people have been killed—or not only about how many people have been killed and tortured and disappeared. The air there is seeded with 25 years of the densest military occupation in the world. What does that do to the psychology—of the soldier, of the Indian, all the factions of Kashmir? It’s a psychotic situation there now, and only fiction can deal with it. Fiction is truth. You turn to fiction when you can’t express reality with footnotes and evidence and reportage. For instance, when Amrik Singh [a secret agent in the novel] visits Musa [a separatist revolutionary] and his father at their home, and just leaves his gun on their floor between all the snacks—will that sort of aggression make it into a human-rights report? Is that a human-rights violation? Not according to the authorities. But it is an act of terrorism. Right. The impunity you evoke is also not limited to Kashmir. I’ve been amazed at how The Ministry of Utmost Happiness is being received. Everybody understands it’s not just about India or Kashmir. People are not looking for a guidebook or history of modern India, you know. They understand that the novel is about human nature, about impunity and the way it affects you. In the US—just in the US—1,000, 2,000 people have been showing up to readings. In Italy, in Holland, in England—people are showing up because the book reflects their reality. Speaking of human nature, one of my favorite characters in Ministry is the defense official Biplab Dasgupta. He is a patriot fighting the insurgency in Kashmir, and so his views are entirely opposed to your own. Yet you’ve done him quite sympathetically. Yeah. Exactly. It would have been so easy for me to make him into a straw man, you know? Easy meat: the evil bureaucrat. But I think he’s such a sophisticated, self-deprecating person—yet he sees things with that coldness of the state. He’s a Nehruvian man, really. He’s opposed to the Hindu right—he’s too sophisticated to be right-wing—and yet he supports the state. He’s the essence of the upper-caste Nehruvian Indian bureaucrat in his ability to take the long view, to remain unattached, to make the cynical decision. He has this distance from the ground, which allows him to skim over the brutal reality of caste. He never immerses himself in the depth of the pain, you know? You just look at it as a law-and-order problem. He’s a technocrat—he thinks emotions don’t matter. Yeah. Yeah, and yet he’s this heartbroken guy, right? He feels his own pain, but even then he is willing to take a long view about it. There’s a connection there. Which brings me to my next question. Both The Ministry of Utmost Happiness and The God of Small Things involve tragic love stories of a sort. That said, before the tragedy arrives—and, in both cases, it’s a political tragedy—there is brief kind of paradise for the lovers. It reminds me of something that John Berger, a dedicatee of this book, once wrote. I’ll briefly quote him: “Desire promises exemption. Yet an exemption from the existing natural order is tantamount to disappearance. And this is precisely what desire, at its most ecstatic, proposes: let’s vanish.” Can love be a form of political opposition? Well, I mean, I think it would be too simple to kind of propose political complexity and pain and tragedy, and then love as an antidote—because, as we know, both things have their own stories despite the other, you know? Even if there were no political tragedy of the kind I’m writing about, love still has its own tragedies and ecstasies. That said, I think it is true that when people are trying to deal with political violence, with politics that invades your life even if you don’t want it, that invades your being because of old hierarchies such as caste—when you’re at the receiving end of that history, your senses grow very, very heightened. Because you’re having to negotiate it and survive it and wonder about it. No one is giving you an easy path to travel… just negotiating becomes a challenge, you know? Especially in India—there’s such a minute hierarchy of caste and tradition. There are so many rules about what you’re supposed to do, how you’re supposed to do it. There are these “love laws,” as I called them in The God of Small Things. The minute you’re either outside the grid or something causes you to come up against the grid, your senses have to be heightened. Have any non-English Indian writers influenced you? “The Reader’s Digest Book of English Grammar” reminded me of Manto’s partition vignettes. Yeah. Of course, I’ve read Manto and Chughtai and all of that, but my biggest influence is actually another genre. You know, in her diary, Tilo asks: “How to tell a shattered story? By slowly becoming everybody. No. By slowly becoming everything.” Where have I seen a storyteller slowly becoming everything? Of course—in a Kathakali performance! The dancer becomes the man; he becomes a woman; he becomes the monkey’s tail lying across the path and refusing to move. He transforms himself into everything—not just human characters, but he is able to be the water and the wind and the person and the epic and move really fast and then slow down and become the woman looking in the mirror. Did you watch Kathakali growing up? Yeah, I did, and one of my great, great heroes is a man who used to teach in my mother’s school for a long time. The other amazing thing about Kathakali is that the performers retell stories everybody knows, year after year, and yet people sit rapt for eight hours or nine hours at night, all night. It amazes me. I loved those thrilling descriptions of nature, of the forest, in The God of Small Things. Whereas The Ministry of Utmost Happiness opens in a city, so initially my heart sunk: Where was the nature going to come from? It finally does in the Kashmir section. Yeah. It also comes in the creatures that invade the metropolis: the owls and the geckos and the dogs and the horses and the vultures. To me, I suppose, growing up in Ayenenem, in a village, my eyes are equally on the lookout for creatures as they are for human beings. Despite their unsparing vision, both your novels harbor a sense of hope in the next generation, in children. You know, one of my essays was dedicated to those who know to divorce hope from reason. Truth is, I really believe that things just can suddenly turn around. Right now, India seems like such a dark tunnel. I mean, even more than Hindu fundamentalism, I fear cretinism—the link to intelligence that’s being broken in our country by the rewriting of textbooks and the mythologizing of history. Imagine a whole generation growing up on cow urine, on the claim that Hindus discovered plastic surgery. You can actually create a generation of cretins by invading academic institutions and rewriting textbooks. It’s terrifying. But I feel that people are quite aware of it. It’s been inevitable, since the birth of the RSS, that we would go through a dark moment. Hopefully, we will come out of it not completely debilitated.